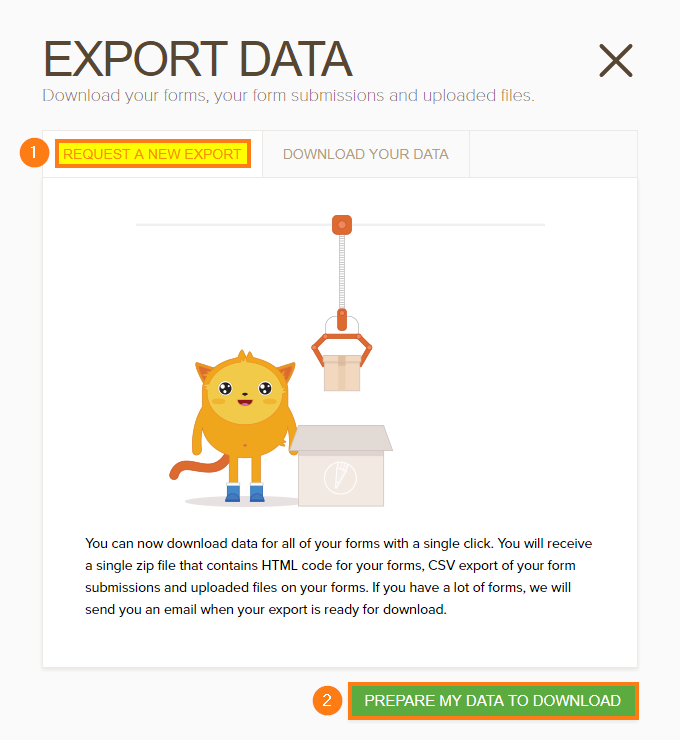 With our Data Export feature, you can download all of your forms as HTML files, your submission data as a CSV file, and uploaded files, all in a single .zip file. To access this feature, go to your Account's Data page then click the green DOWNLOAD MY DATA button. On the EXPORT DATA wizard, click the PREPARE MY DATA TO DOWNLOAD button. If you've done this at least once before, go to the REQUEST A NEW EXPORT tab first, then click the PREPARE MY DATA TO DOWNLOAD button. When the .zip file is ready, you’ll receive an email notification with a link to the file. 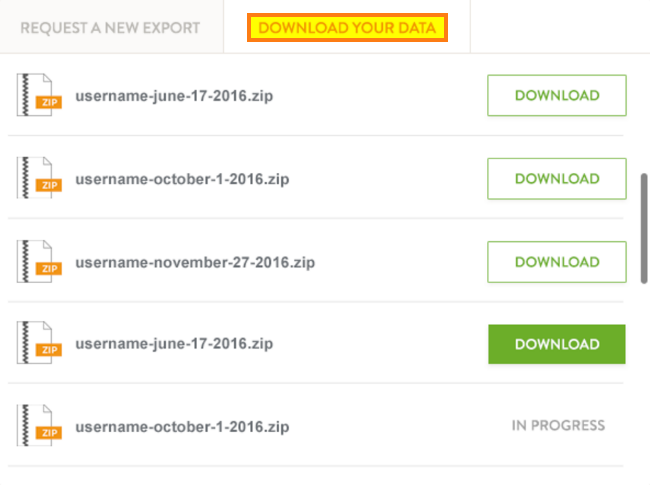 You’ll also be able to find every file you’ve ever requested on the DOWNLOAD YOUR DATA tab. The time it takes will depend on the total size of your data. If you have a relatively huge collection of forms, uploaded files and submission data, give it some time to finish. How do I read the data? I downloaded the form data, but they are encrypted forms and the data is showing up as random letters. I dont see any PDFS on the download, just junk files I cant use - like css. But how do I export just the email addresses because this is all I need. Is there a way to automate this process? For e.g. sending exported csv file as an attachment to an email every day. how to do i view and export photos that have been submitted via my form? I'm running this process, but my files/downloads are empty. Can we download form data in CSV for specific time frame? Can I create a form with a required age-restriction?